“I’ve carried the torch of my mother’s food,” says Mitchell Davis, the chief strategy officer of the James Beard Foundation. He is the cook in the family who siblings and friends call to ask how his mother Sondra made her exceptional chicken soup or formed her feather-weight matzo balls in their kitchen in Toronto. “It allows me to set the tradition,” says Mitchell. It’s a tradition he started to take ownership of early on. “From the time I was three or four, I was fascinated with cooking,” he says. “I famously used to pretend I was sick to stay home to watch cooking shows.” His mother cooked and entertained often, but struggled with migraines and ultimately lost most of her sight. She relied on Mitchell and his sister Carrie for help. “I did a lot of ‘my mother’s’ cooking especially for the holidays,” he explains. The holiday parties were always as large as the family’s dining room table, with friends and family totaling 13 or 14 people gathering for the feast. No matter the holiday, the menu included, brisket, challah, chopped liver, matzo ball soup, kasha varnishkes, farfel, sour cream cake, and mandel bread. 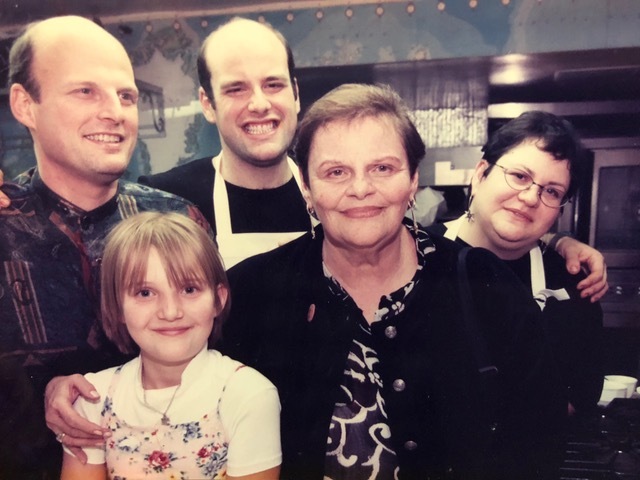 The Davis family in the kitchen of the James Beard Foundation in 1996 for the first annual James Beard Foundation Latke Cook-off. (from left to right: brother Sheldon, niece Helen, Mitchell, Mom Sondra, and sister Carrie (not present, sister Leslie). “The family recipes are our recipes,” he says, not just his mother’s. The ownership is shared across the generations in the Davis family. In the early aughts, Mitchell set out to document them for a charming book called The Mensch Chef. His mother came to New York and the two cooked together, allowing him to capture her technique. For matzo balls, she preferred heavy, dense ones, but ironically always made the lightest matzo balls. “She said she used the recipe on the box, but when we cooked together,” he says, it was clear that she didn’t. He wrote down recipes for dishes like Jewish spaghetti, elbow macaroni with tomato sauce, butter, and a bit of sugar, that Mitchell grew up thinking was a dish every Jewish household made. He documented his mother’s chopped liver, which she always insisted on chopping by hand with a mezzaluna in a wooden bowl, and challah, which was wrapped into a turban shape for Rosh Hashanah. Unlike the books of Joan Nathan and Claudia Roden that Mitchell admires, he didn’t travel to research the roots of these Jewish dishes. “These were just the recipes from my family,” he explains. “This is what we ate…as a non-observant New York-ish Jewish family,” living in Toronto. The family repertoire is also one that grew over the years, with new dishes joining the table. The brisket in his book “is not my mother’s. It’s Adam Rapoport’s mother’s recipe,” Mitchell explains, referring to Bon Appetit’s editor-in-chief. He was introduced to her recipe, which uses ketchup, brown sugar, and Worcestershire to make a barbecue sauce, and prepared it for his family. 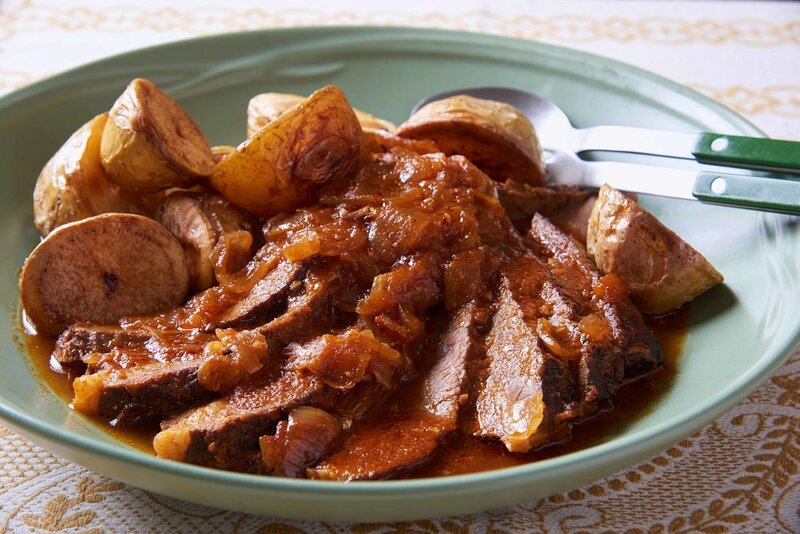 “My whole family liked her brisket better than ours, so it became our family recipe,” he adds. The same is true for the honey and walnut cake he shared with us, which originally came from cookbook author Richard Sax. Sondra passed away before The Mensch Chef came out, but the book has helped carry the torch of her food forward, while leaving space for recipes and family traditions to shift and adapt when something new comes along that everyone enjoys. 1. Begin by cleaning the livers. Rinse each under cold running water. With a sharp paring knife, separate the two lobes. Cut away any visible fat, membrane, or green patches on the livers. Place in a strainer to drain. 2. Meanwhile, heat the schmaltz in a large, 10- or 12-inch heavy frying pan. Add the chopped onions and saute, over medium-high heat, until soft and translucent, 7 to 8 minutes. Add the cleaned, drained livers and saute until cooked through, 15 to 20 minutes. Add the salt and black pepper. Allow any liquid that the livers release to evaporate as they cook. Remove from the heat and cool. 3. If using a wooden chopping bowl, transfer the cooked livers and onions to it. Add the mustard and horseradish. Using a metal chopping blade, chop the cooked livers into a small dice. Some of the livers will break up to mush, others will hold their shape. The goal is to obtain a spreadable combination of small pieces and paste. If not using a chopping bowl, chop each liver by hand on a cutting board using a very sharp knife, and transfer to a mixing bowl. 4. Add the chopped eggs, mix well, and adjust the seasoning with additional salt and pepper if necessary. Adding more schmaltz will smooth out the flavor of the liver and the texture. Use your judgement. The chopped liver can be made up to two days in advance and refrigerated at this point. 5. On the day of serving, remove the liver from the refrigerator. Using a handheld box grater, grate the remaining onion into the liver, holding onto the root end for leverage. Mix well, taste, and adjust the seasoning, which will have changed after sitting and chilling. 6. Serve with dark bread or crackers and some grainy mustard on the side. 1. Make the soup: Place the quartered chicken, necks or feet (if using), onions, celery, parsley root or parsley, carrots, turnip, parsnip, peppercorns, star anise, and salt in a 12-quart stock pot. Add 5 quarts (20 cups) of cold water and set over high heat to boil, about 30 minutes. 2. Turn down the heat to a simmer, set the cover ajar on top of the pot, and allow to cook for 2 hours, using a large spoon to skim off any scum that rises to the surface. 3. Add the dill and simmer an additional 45 minutes. 4. Turn off the heat and allow to cool. 5. When cool enough to handle, ladle the soup through a fine sieve into storage containers. Chill overnight. Remove any fat that congealed on the top of the soup and store for up to two days or freeze until ready to use. 6. Make the matzo balls: Combine the eggs, salt, schmaltz and soup or water in a mixing bowl and whisk until blended. 7. Using a fork, stir in the matzo meal and mix until smooth. Let set in the refrigerator for 30 minutes, until the matzo meal absorbs the liquid and the mixture sets near firm. 8. In a large pot, bring your chicken soup to a simmer. In a separate pot, bring about 5 quarts of water to a boil with 2 tablespoons of kosher salt. 9. Remove the matzo ball mixture from the fridge. Wet your hands with cold water and shape a heaping tablespoonful of the mixture into a ball in the palm of your hands. Coax the matzo ball into a sphere. Rolling it too tightly will prevent it from achieving its puffiest. Drop into the boiling water and repeat with the remaining mixture, cleaning and wetting your hands as necessary to keep the matzo balls from sticking to your skin. Be careful not to crowd the pot you are cooking the matzo balls in or they will not cook through fully. 10. Bring the pot back up to a boil, turn down the heat to a simmer, cover tightly and cook for an additional 35 to 40 minutes, until the matzo balls have risen from the bottom of the pot and have blown up to about twice their original size. Occasionally a matzo ball or two will stick to the bottom of the pot. Give it a nudge with a spoon to loosen. 11. While your matzo balls cook, make the vegetable garnish: Add the sliced carrots and diced turnip to the simmering pot of soup, and cook for 30 minutes. Add the celery and cook about 15 more minutes, until all of the vegetables are tender. Add the dill. Keep warm until ready to serve. 12. Using a slotted spoon, remove the matzo balls from the boiling water and place them directly into the simmering chicken soup. Or, if preparing in advance, remove them from the cooking liquid and let them drain on a cookie sheet. Freeze them on the sheet until they are firm, and then transfer them to a resealable plastic bag. Defrost them in simmering soup directly from the freezer. 13. 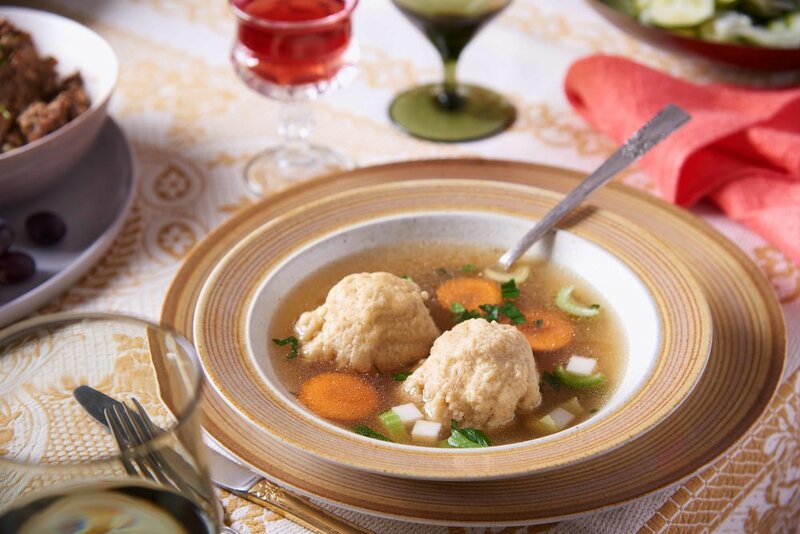 To serve, transfer the matzo balls to bowls and ladle the soup and vegetable garnish over top. 1. Prepare the vegetables: Slice the cabbage, cut the cauliflower into small florets, peel and slice the carrots, kohlrabi, daikon, slice the pepper, or otherwise prepare whatever you are using. The smaller the pieces the faster they will ferment. Pack the vegetables into lidded nonreactive container(s) (plastic, glass, or ceramic). 2. Make the brine: dissolve the salt into 2 cups of water that you heat in 1 minute intervals in the microwave or over the stove. Once the salt is dissolved, add 6 cups cold water to cool the brine to room temperature. Add the peppercorns, chili pepper, and spices. 3. Pour the brine over the vegetables to cover. If you need more brine, make it in the same ratio by dissolving 3 tablespoons of salt into 1 quart (4 cups) of water. Cover the container(s) and let sit at room temperature for 2 to 5 days to ferment until the desired doneness. Open the containers at least once each day to release any gas that builds up (called “burping”). I like to taste them each day so I know how the flavor is progressing. On the first day you won’t see any change. On the second day you might see some bubbles. By the third day there will be more evidence of fermentation. Bubbles, a distinct smell, and the brine will begin to get cloudy. Some gunk may form on the top. Don’t worry about this. It is normal. 5. 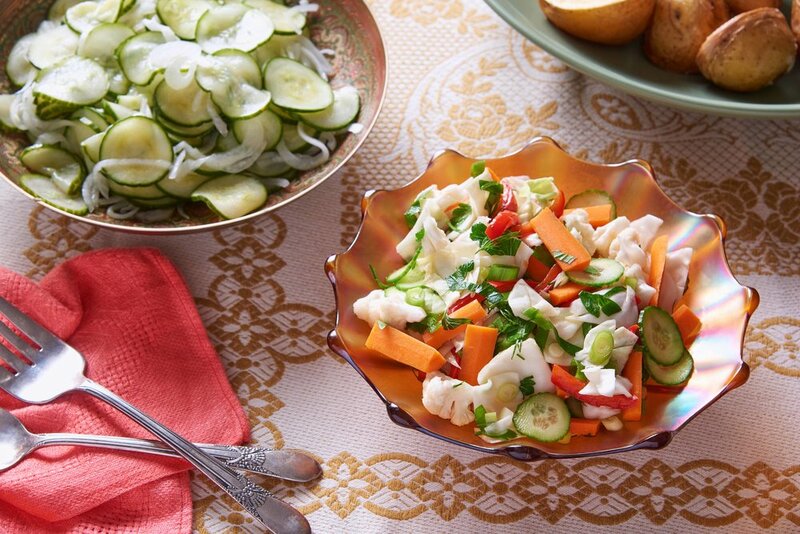 To assemble the salad: combine the fermented vegetables. Add the cucumber, scallions, dill, herbs, if using, and olive oil. Toss and taste. Adjust the acidity with vinegar if necessary, and season with pepper. The salad will keep two or more weeks in the fridge. 1. Using a food processor or handheld mandoline, thinly slice the cucumbers and place them in a large bowl. Sprinkle the cucumber slices with the salt, tossing the slices around to distribute the salt evenly. 2. Place a place on top of the salted cucumbers to weigh them down, and let sit at room temperature for at least 1 hour but no more than 2, until the cucumbers have given up a lot of their water and wilted. 3. Drain the cucumbers, rinse under cold water, and drain again. Add the sliced onion to the cucumbers. 4. Combine the vinegar and 1 cup cold water and pour over the cucumbers. If using sugar, it is best to dissolve it in a little hot water and then add that mixture to the cucumbers. 5. Pack into a 1-quart glass jar or other non reactive container and refrigerate. The cucumbers can be eaten right away, but they are best after they have sat for a day or two. They will keep about two weeks in the refrigerator. Chef’s note: All the Davises are lovers of sour things, so we never put any sugar in the dressing. But if you find the vinegar solution too strong, you can add a tablespoon or two of granulated sugar to help cut through the acid. You can also play around with peeling or not peeling the cucumbers, a decision I make based on what color I would to add to the meal, or my mood, or my degree of laziness at the time of preparation. 1. To prepare the sauce: heat the oil in a large sauté pan or saucepan set over high heat. Add the onion and sauté until golden brown, 6 to 8 minutes. Add the garlic and continue cooking for an additional minute or two. Add the carrots. Squeeze the tomatoes into the pot, breaking them up into smaller pieces between your fingers. Add all of the juice from the tomatoes, plus about ¼ cup of water that you use to rinse out the can. Add the brown sugar, vinegar, salt, pepper, and bay leaves, and bring to a boil. Turn down the heat to a simmer and cook for 10 minutes. 2. Add the chopped green pepper, black pepper, and salt. Stir, cover, and let simmer for about 5 minutes, until the green pepper is wilted. Stir in the raisins. Cool to room temperature. 3. For the fish: heat the oil in a large sauté pan set over high heat. Dredge the fish fillets in flour and place in the hot oil. Don’t crowd the pan. Season the fillets with salt and pepper while they fry until very light brown, no more than 2 or 3 minutes. Flip and cook for another 2 minutes or so. Remove from the pan and pat dry with paper towels. 6. To assemble: preheat the oven to 350° F. Spoon some of the sauce onto the bottom of a 2-quart rectangular baking dish. Arrange the fried fish fillets on top in a single layer. Pour the remaining sauce over the fish. 7. Bake in the preheated oven until cooked through, about 20 minutes. Test for doneness by pressing the fillet with a butter knife to see how easily it flakes; when it breaks easily into tender flakes, it is ready. Remove the fish from the oven and cool. Serve warm or at room temperature. 2. Place the oil in a large, 10- or 12-inch saute pan over high heat. Place the trimmed brisket in the hot oil, fat side down, and cook until browned, 5 to 7 minutes. Season the brisket with ½ teaspoon of the salt and ¼ teaspoon of the ground pepper. Turn over the brisket and brown the other side. eason this side with the same amount of salt and pepper. If the brisket is too large to fit the pan, you may have to cut off the tip and brown it separately. 3. Meanwhile, in a large mixing bowl, combine the onions, garlic, brown sugar, Worcestershire, mustard, vinegar, chili powder, paprika, remaining salt and pepper, the ketchup, and 1 ¼ cups water. Use some of the water to rinse out the ketchup bottle. Stir until well blended. 4. Transfer the browned and seasoned brisket to a roasting pan or Dutch oven just big enough to hold the meat with about an inch of space around it. Place the 2 bay leaves on top of the meat and pour the ketchup mixture over. 5. Cover the roasting pan (using aluminum foil if the pan doesn’t have a cover) and set in the preheated oven. Roast for 2 hours. 6. Remove from the oven and uncover. When the brisket is cool enough to handle, transfer it to a cutting board. Slice the brisket on an angle across the grain. The slices should be less than ¼ inch thick. As you slice the meat, transfer the slices back to the cooking liquid. When all of the meat is sliced, pour any juice on the cutting board back into the roasting pan, re-cover it, and return it to the oven for 1 ½ to 2 hours, or until the meat is tender enough to cut with a fork. Remove from the oven and cool. 7. To store, lift the meat out of the gravy and store separately. To reheat, layer the meat with some of the gravy, cover, and bake in a 325°F oven for 30-45 minutes, or until warm. 1. Preparing the dough by hand: In a large mixing bowl, combine the water and the honey or sugar and stir to dissolve. Sprinkle the yeast over the liquid and set aside to proof about 5 minutes. The yeast should dissolve and froth if it is active. If it does not react this way, discard and purchase new yeast. Unfortunately, you’ll have to wait to make challah. 2. Using a sturdy wire whisk, beat in the eggs and the ¼ cup oil or melted butter until frothy and well blended. Add 2 cups of the flour and the salt and continue beating to form a smooth batter. Switch to a sturdy wooden spoon and stir in 2 ¼ more cups of the flour to form a stiff dough. 3. Dust the work surface with some of the remaining ¼ cup flour and turn out the shaffy dough from the howl onto the floured surface. Using a dough scraper and your hands knead the dough until it is smooth and holds its shape, anywhere between 5 and 10 minutes depending on how strong you are and how rigorously you are kneading. If the dough is too sticky to handle, add some of the remaining flour in small doses, trying to keep it on the soft side. To knead properly, keep folding the dough in half on top of itself and pushing it down on the counter away from you to reform a sort of blob. Scrape it off the surface with the dough scraper and fold again. When you are finished, the dough should be smooth, not sticky; soft but elastic enough to hold its shape; and pale yellow in color without any evidence of unincorporated flour. 4. Preparing the dough in an electric mixer: In the bowl of an electric mixer, combine the water with the honey or sugar and stir to dissolve. Sprinkle the yeast over the liquid and set aside for about 5 minutes to proof. The yeast should dissolve and froth if it is active. Using the paddle attachment, beat in the eggs and the ¼ cup oil or melted butter until frothy and well blended. Add 2 cups of the four and the salt and continue beating to form a smooth batter. Switch to the dough hook. Add 2 ¼ cups flour and knead with the dough hook for 4 to 5 minutes, until a smooth, elastic dough forms. Dust the work surface with some of the remaining ¼ cup flour and turn out the dough. Knead five or six times until soft. 5. Proofing the dough: Once kneaded, shape the dough into a ball by folding the edges underneath and stretching the surface. Place the remaining tablespoon of oil or melted butter in a clean bowl and distribute it over the surface with your hands. Place the ball of dough upside down in the bowl to coat the surface with grease and invert to right side up. Cover the bowl with plastic wrap and allow the dough to rise in a warm place (near a preheating oven, for example) until doubled in bulk, about 1 hour 45 minutes. 6. Remove the plastic wrap and punch down the dough with your fist to compress it to its original size. Recover and let sit for 15 minutes. 7. Turn the dough out onto the lightly floured surface. Sprinkle the raisins on the dough and knead slightly to incorporate. Pat the dough on the work surface with the palms of your hands to form a large rectangle, about 16 inches by 12 inches. Poke any stray raisins into the dough. Roll up the dough like a jelly roll along the longer edge to form a log about 18 inches long and 2 ½ inches in diameter. 8. Starting at one end, roll the log into itself to form a turban or snailshell shape and transfer to a cookie sheet or pizza pan. Tuck the outer end underneath to secure it. Cover with a clean dish towel and let rise in a warm place until doubled in bulk, about 1 hour. 9. Preheat the oven to 400°F. When the dough has finished rising, brush the entire surface with the egg wash.
10. Place in the middle of the preheated oven and let bake for 20 minutes until the surface begins to brown. Lower the temperature to 350°F, and continue baking for an additional 15 to 20 minutes, until the surface has turned a deep brown and the loaf sounds hollow when you tap it. An instant-read thermometer inserted in the center of the bread should read at least 190°F when done. 11. Remove from the oven, transfer immediately to a cooling rack, and allow to cool completely before serving. 1. Preheat the oven to 350°F and butter a 13-by-9-inch baking pan. 2. To make the cake, pick out 24 of the best-looking walnut halves and set them aside. Place the remaining ugly walnut halves in the bowl of a food processor fitted with a metal chopping blade. Add the sugar. Process with 20 to 25 one-second pulses until the nuts have ground to a coarse meal. Be careful not to overprocess or the nuts will expel some of their oil and turn into a mess. 3. In a large, heavy saucepan, combine the butter, 2 cups water, honey, cinnamon, salt, and the ground walnut-sugar mixture. Set over medium-high heat and cook, stirring frequently, until the butter melts and the mixture is uniformly combined. Remove from the heat. 4. Stir in the flour, baking powder, and baking soda, until blended. 5. Pour the batter into the prepared pan and smooth out the top with the back of a spoon or a spatula. 6. Arrange the reserved attractive walnut halves in even rows across the top of the cake. Push them down gently so they sink somewhat into the batter. 7. Bake the cake in the preheated oven for 30 to 40 minutes, or until the top is golden brown and firm to the touch, and an instant-read thermometer inserted in the center reads at least 185°F. Place the cake pan on a wire rack and cool to lukewarm. 8. Meanwhile, prepare the syrup. Combine the honey with ½ cup water in a saucepan and set over medium-high heat. Add the lemon zest and continue cooking until the mixture comes to a boil. simmer, stirring once in a while, until the mixture becomes syrupy, about 7 minutes. Remove from the heat and stir in the lemon juice. 9. While the cake is still warm, spoon the syrup evenly over the top, letting it sink in before you pour on the next spoonful. The cake should sit for at least 4 hours to absorb the syrup, or better yet, overnight. 10. Cut the cake into squares with a walnut half in the center of each. Eat the edges yourself, privately. Store wrapped airtight for up to 1 week. Reprinted and partially adapted from The Mensch Chef © 2002 with permission from the author.